Transmit free WordPress theme is a streamlined RSS aggregation template inspired by another design from “AllTop.com”. Transmit theme allows you to configure a single page with an unlimited number of RSS feeds from any website! If you are looking for an advanced blogging or news theme, Transmit free theme is definitely NOT the WordPress template for you. You can create static pages; however, Transmit free theme does not support blog posts at this time, which is intentional. You can also add standard 468×60 and 728×90 advertisements via the theme options page. All that goodness for nothing at all — make sure to download Transmit free WordPress theme at the end of this post as soon as possible! 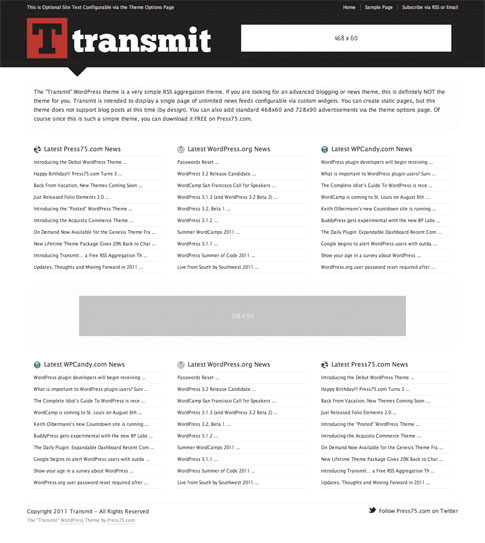 Come back and check out the showcase as we find more sites from around the web using Transmit.